The mission of the Plano Sustainability and Environmental Education Division is to educate and engage the community in sustainable practices and environmental stewardship. Through Live Green in Plano the Sustainability & Environmental Education Division educates and involves residents of all ages in activities promoting beautification and environmental stewardship through recycling, composting, household chemicals, litter reduction, electronic recycling, water conservation, energy conservation and air quality. The Environmental Education Center is a place to educate and involve residents, community and environmental leaders, building professionals, and educators in environmental responsibility and demonstrate sustainability concepts and practices. The Environmental Education Center, Plano's first LEED Platinum-certified building, was designed to incorporate as many sustainable practices as feasible. Tours and programs, including semi-annual family nature events, are offered at this location. Outside the building is the Nature Explore® Certified Classroom that was designed to engage children in exploring and interacting with nature as part of their daily lives. Inviting play areas encourage a deep appreciation for the natural world while strengthening skills in science, math, visual-spatial thinking, language, literacy, art, music, and movement. The surrounding landscape showcases key ecological concepts, including life cycles, water issues, gardening, recycling, animal habitats, and composting. 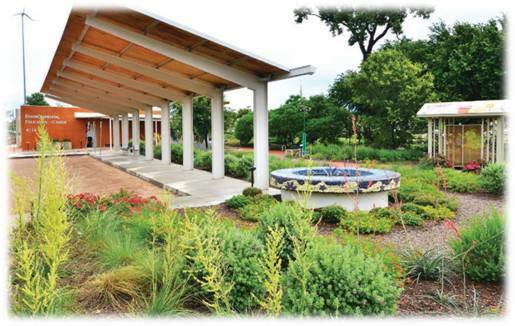 The landscaping at the Environmental Education Center features a Texas SmartScape® Demonstration Garden that showcases native and well-adapted plants for the North Texas area, which are both heat and drought tolerant.